The giga-tyres.co.uk online store is delighted to be able to offer you all kinds of tyres along with a huge selection of quality rims. Whether you prefer alloy rims or steel rims is entirely up to you. 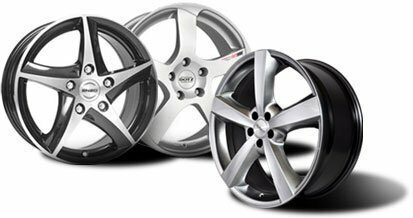 However, alloy wheels are considered a stylish wheel choice, which can enhance the outward appeal of your car. If you simply want to buy new rims for your tyres, we will help you find the right alloys. If you prefer changing your rims and tyres all at once, you can also opt for complete wheels with aluminium rims instead. Keep the correct tyre and rim size in mind before you search for your new set of alloys. If you have any questions about which alloys are right for your vehicle, you can simply reach out to our friendly customer service team that will be happy to help you. Alloys are made from either magnesium or aluminium. Given that mixed metals are used in the production of these rims, you can thus expect them to be especially sturdy. From the light weight of these wheels to their good heat conduction, there are many reasons why you might like to consider buying alloy wheels. Moreover, these rims are even said to enhance the brake performance of your vehicle. From budget to premium alloy and steel wheels with tyres, you will find many design choices here. Compared to standard rims, alloys are simply more expensive to produce, which is why they might not come with your vehicle as OEM rims in the first place. If you are looking to upgrade your rims, you have certainly come to the right place. After all, we offer these accessories for your car at comparatively low prices. Nonetheless, there are several top brands for you to choose from, why we recommend taking your time to really browse are massive alloy range! Of course, speedy delivery is ensured as well.